Inside Out band members (from left), bassist Timothy Solomon, lead guitarist Semesa Vilise, drummer Ratu Viliame Dautei and lead singer and guitarist Apakuki Nalawa. Realising their newest single ‘Sega Ni Na Druka’ has become another stepping stone for local band, Inside Out. After being requested to create the new track by one of their followers from the United States, the band created the song and released it on September 25. 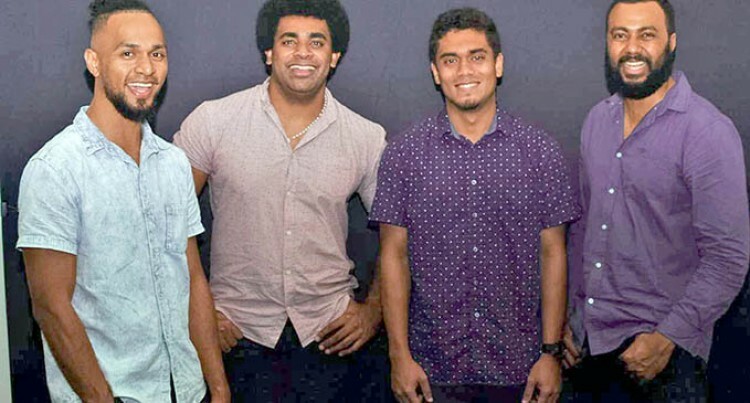 According to the band’s lead singer Apakuki Nalawa, they asked fellow musician Viliame Cokanauto to write the lyrics for the love song. Mr Nalawa composed and produced the track. Fiji Sun Leisure got a chance to sit down with Mr Nalawa who spoke about the new single. “The reason why I took on the project was that the band hadn’t done a song like this before. So we wanted to reach out to a different fanbase locally,” he said. Tell us about the music video. Who shot/directed it? You can watch it online on our Inside Out Facebook page or on Youtube. It’s self directed, but photography was done by Peter Keen. It’s our first ever self-produced music video. It shows us performing and chilling in our element. There are other music videos from us out there, but those were not self-produced by us. Talk to us about your album. We released our album in March this year called ‘Let the Music Play’. At the release, we performed at a concert at the Onyx Night Club. We are currently planning on releasing new singles right now. There are plans in the pipeline for other singles. We are almost done with those new songs. What challenges have you faced in getting this new track off the ground? Up to when we released our album, we had been relying on others to help produce our music. These new songs and music videos are all produced by our band. We had to learn how to produce it all. Right now we are just concentrating on self-producing all our own content and our collaborations with others. We are aiming to branch out into Pacific. We want to take the Fiji Music Industry up a notch. We want to explore the music scene and make a good living out of it. We get bookings to perform around Fiji. We hope to get more bookings for more performances. Where and when can audiences find your band performing? We play weekly at Chill Bar (at Carnivan Street, Suva) from 7:30pm to 9:30pm on Fridays. How has music helped you personally? Being a musician in Fiji, the music drives me. It betters me each day. Music has changed my way of thinking and I apply it to every situation in life. What advice do you have to give to struggling musicians trying to come up in the local music business? Find that thing that you’re good at. Stick to what you’re good at and build on that. And don’t worry or be disheartened by your weaknesses. Some people worry too much about their weaknesses and forget about their strengths. Find your market. Think outside the box. How many singles and albums have been released? One album and two singles. The other single released is called ‘Sweet Talking’. Where do you band members see yourselves in five years? We see ourselves as businessmen, still making music then. Any last words for our readers. I would ask people to support local talent. There is a lot of local music talent here.